The subgrid stress tensor is supposed to have a tensorial relation with the strain rate tensor. In the figure the r.m.s. (root mean square) values of longitudinal velocity component for a plane channel flow at Reτ=180 are plotted and compared to an isotropic model, to Direct Numerical Simulations and to experimental data. 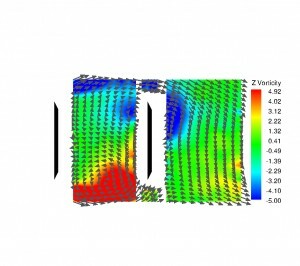 We employ a dynamic Large Eddy Simulation model for turbulent convection at Rayleigh number 109. 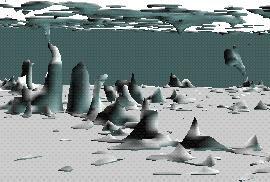 In the figure the isosurfaces of temperature showing the most intense upwelling thermal convection plumes are plotted. The fluid is in turbulent convective regime. 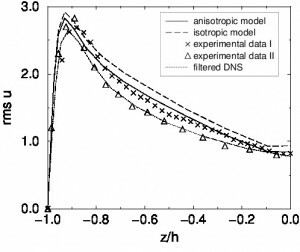 We use Boussinesq approximation for the water-ice mixture and we employ a dynamic LES model. In the figures: in light blue are plotted the downwelling cold thermal plumes, in gray the ice formation regions. Top figure: fast formation regime: ice is contained inside most intense downwelling plume. 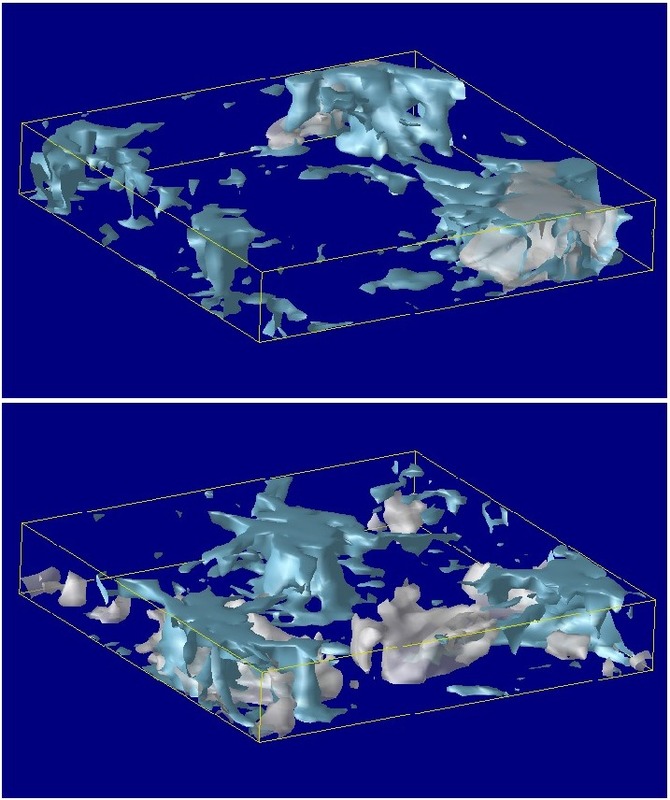 Bottom figure: slow formation regime: ice is present in wide areas. The flow around two in-tandem plates normal to the free-stream velocity at Re=8000 has been simulated with LES. 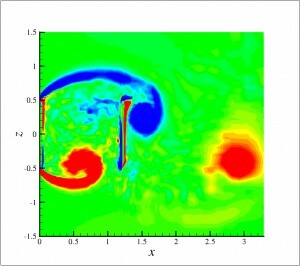 The obtained vorticity field (upper figure) is compared with experiments (lower figure). The periodic hill flow represents a classic test case for hybrid RANS/LES methods. 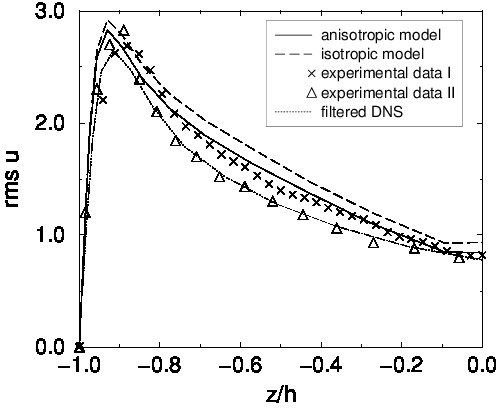 The figure shows a longitudinal velocity visualization and refers to a simulation performed with the hybrid RANS-reconstructed method presented in [A.Abbà et al., “A DG Implementation of a Novel Hybrid RANS/LES Technique With RANS Reconstruction”, http://arxiv.org/abs/1411.4882]. 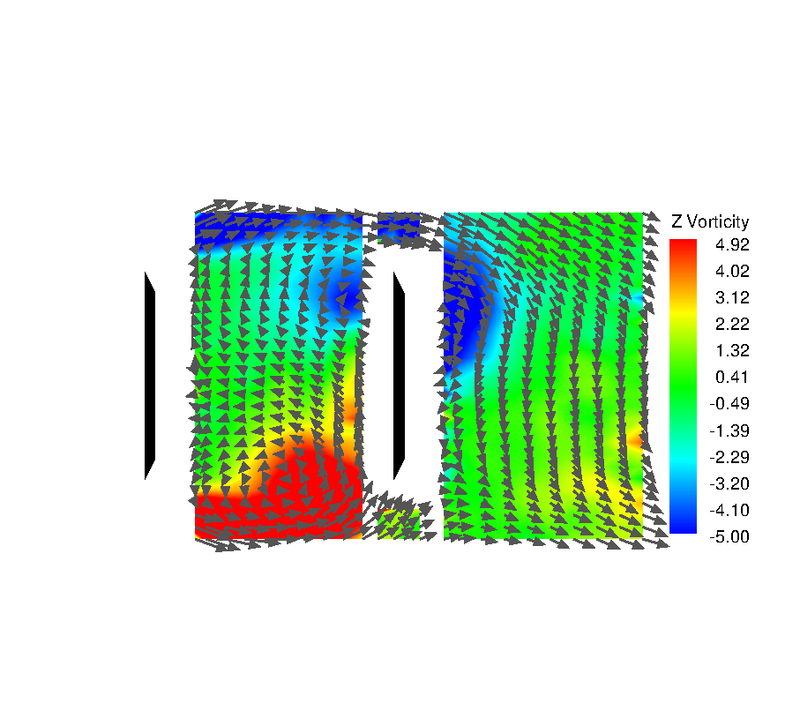 In particular, in these simulations a constant RANS/LES blending factor equal to 0.5 has been considered. The numerical results show a good qualitative behaviour, with a separated flow after the first hill.